I gave you a few days, so did you do your homework? If so, then you are ready for this section. If you reside in a county where you do not contribute to Social Security, then no matter what your other mandatory options are (Gwinnett, Rockdale, etc. ), you really need to make sure to put a total of at least 12% of your salary away. For example, in Gwinnett this would mean starting a 403(b) with a 6% contribution (pre-tax) every pay period. I get to 6% by starting with my 12% goal and subtracting 5% (TRS) and 1% (GRS). In Rockdale, you would start an additional 403(b) - on top of the employer and employee mandatory 403(b)s - with a contribution of 5% (pre-tax) every pay period. Start with your 12% goal and subtract 5% (TRS) and 2% (mandatory 403(b) from the employee). For those that do contribute to Social Security, you are actually already at 11%, so even if you can just put away that 1% into a 403(b), that is better than nothing. This will just mean that in retirement, you can have a savings account already established. If you make 45,000 a year, and you contribute just 1% per month ($37.50) the first year, and you increase it just 2% every year for twenty years, you end up with over $25,500 assuming an 8% per year rate of return. This is just a basic guide, and by all means, if you can do more, you should, but these should be good numbers to start with. Once you see it really does not affect your take home pay, look to raise it by 1% or 2%. Once you get to retirement, you will feel a whole lot better about what you have accomplished! Next discussion in a couple of days will be about 403(b) providers. Are all of them the same? NO! First, most people in the business world are usually told to make sure that their total contribution is at least 10% of their annual income (hopefully the employer chips in on top of this). Thus, if I contribute 10% to retirement plus 6.2% to Social Security, I have actually taken out 16.2% of my salary before I receive a dime. Remember this is pre-tax though, so it really only costs me about 11.3% in take home pay. It sounds tough, but if you are vigilant and want to have a secure retirement it is necessary. Once you become used to it, it is not quite as bad. As educators, the 10% mantra is a bit different though. The problem is in Georgia 5.2% of your income is already going to the Georgia Teachers Retirement System (TRS). So how much should you really contribute? Well, there are additional factors to think about. Different counties in Georgia have different additional retirement plans (some a discussed below). So we need to think about them first. Some counties do not contribute to Social Security (check your county and/or pay stub to find out), so you will need to factor that in when contemplating how much to contribute. By the way, Social Security is a 6.2% payment (set by law). In Gwinnett County, educators do not contribute to Social Security, so they have setup an additional pension for them called the Gwinnett Retirement System (GRS). If you are a Gwinnett educator, I suggest clicking on this link to the "About GRS" webpage. The basics of the contribution part of the plan is that 1% of your salary goes to the plan. That's it. You have 5.2% of "extra" income because you do not contribute to Social Security. That would make a tidy sum to use towards your 403(b). In Rockdale County, educators do not contribute to Social Security, so they setup a mandatory 403(b) plan for their employees. Each employee must setup two mandatory 403(b) accounts when hired. The first will be funded by the county with 4% of your salary being contributed (100% vested on day one). The second is an employee funded 403(b) with 2% of your salary being contributed. Since you do not contribute to Social Security, this means you have 4.2% of "extra" income. This is also a nice sum to contribute towards your own 403(b) plan (you would have to setup an additional plan - I know it sounds stupid to me too). Click the link to see the Rockdale Website - "Additional Benefits". In Henry County, educators DO contribute to Social Security. This sounds like you would be doing more than everyone else, but remember, you will get Social Security benefits, and the others will not. Your homework is to find out whether you contribute to Social Security or not. In the next section, we will continue with the discussion. Why Is Gasoline So High? 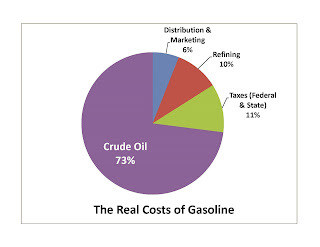 Earlier this week, I wrote a blog for my company called "Who Is to Blame for Gas Prices?". I received a number of e-mails about it, so I thought I would share it with you. The summer is traditionally the time when most educators look for homes, so I wanted to make some comments on the current situation in light of the financial "credit crunch" that has been happening. First, the mortgage industry has changed dramatically in the past year, and it has definitely become more stringent for those that want to get a mortgage. Recently, a friend went to go get a mortgage to purchase a house. He put down 10%, and in the past, he could have an 80-10 loan, but not anymore. He was offered a 90% loan with PMI due monthly and mandatory escrows with a year of escrows due at closing. This is a huge change from two years ago. The industry went from begging people who could not afford it to take their money (pendulum swings), to making low risk people jump through hoops to get it (pendulum swings back). His result was a good closing on a good house, but the free money era has ended… for a while until the pendulum swings back again. Be conservative in what you are looking for and how much you believe that your home will appreciate. Just because someone says that this home will go up 10% a year does not mean it will. Mortgage rates are still at historic lows, but the current threat of inflation has them on the rise. This does not mean that you need to run out and buy a home before they hit 8%, but it also does not mean that they will get to 7% and come back down immediately. The Fed targets short term rates (and inflation). If you hear the Fed could be raising rates, this could be a positive for the mortgage rates. Just talk with your loan officer, and if they are any good, they should be able to give you some guidance and advice. Since I am getting back in the swing of this blog, I know that all of the educators are too. My wife has been busy gathering some materials together for some leadership lesson plans. As she says, it is much easier to get it done now on her time frame than trying to get it done once school starts and she is swamped! Salary - Are you getting paid on the right schedule? Check the schedule from the HR department with your experience and degrees. Insurance - Make sure you have the right insurance set up - single or family? PPO, HMO, etc.? High option or standard? Retirement - Where are you in number of years? How many years left? Are you vested? You should be able to see where you are with your pension. Also, do you have a 403(b)? Should you increase your contributions? Are you in the right investments? Get these things done now before the school year starts, and your first few weeks will be so much easier. Good luck and keep the e-mails coming!